are sure to catch your eye. 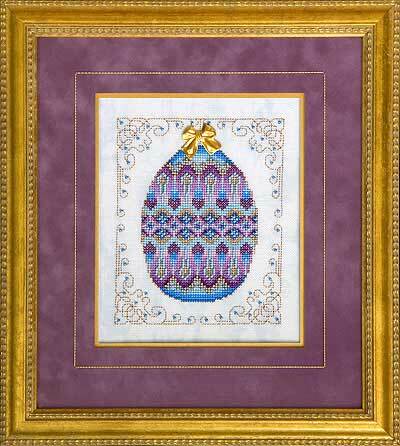 Add elegance to your Easter décor with this exquisite egg that’s anything but ordinary. Stitch just one or collect the set of four. Each one is unique, yet they complement each other beautifully with a full range of pastel colors to celebrate the Easter season. A different brass bow is provided for each design. Fabric: Stitched on 28 count Blue Whisper (Item #3281/5139) Vintage Cashel Linen by Zweigart. Materials Summary: A total of 10 Anchor colors used in model. DMC comparable (best match) colors are provided in chart. Chart includes brass bow embellishment.